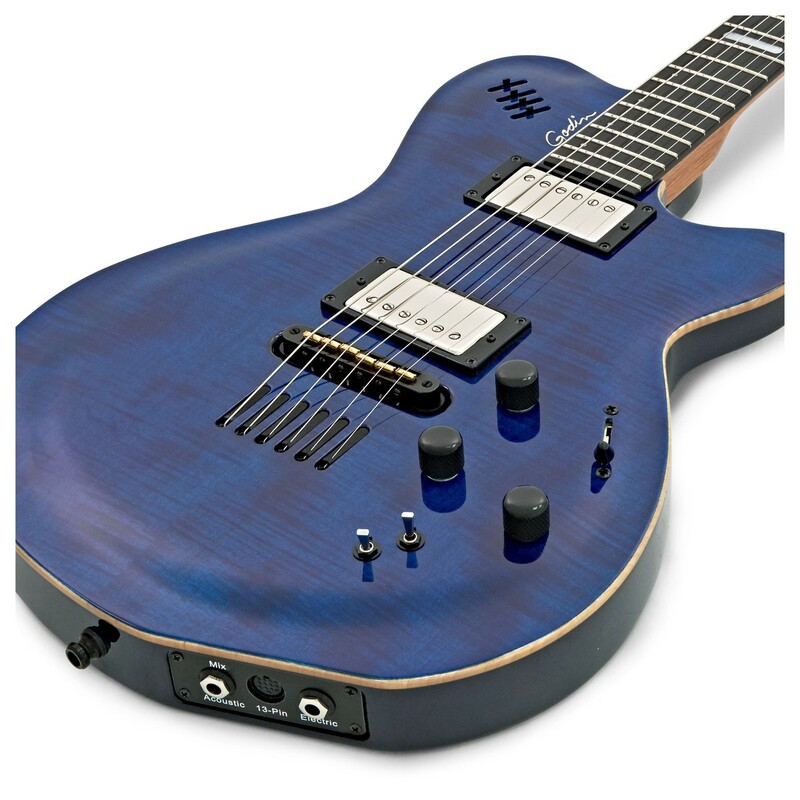 The Godin LGX-SA, Translucent Blue is equipped with a wide array of tools for the ultimate in performance-flexibility. Utilising a pair of custom Seymour Duncan humbuckers (SH II Jazz in the neck and a Custom III in the bridge), the LGX-SA can deliver everything from pristine cleans and gritty crunch all the way up to searing leads. In addition, the LGX-SA features a unique bridge design loaded with RMX Hexophonic transducer saddles and a custom-designed Godin preamp for a beautiful and organic acoustic tonal output. The LGX-SA also features synth access that provides infinite possibilities for unleashing a player's true creativity, perfect for the player that transitions from instrument to instrument when performing live. Furthermore, its solid mahogany body adds warmth and resonance to the overall tone, while its flame maple top adds great sustain and a striking visual appeal. 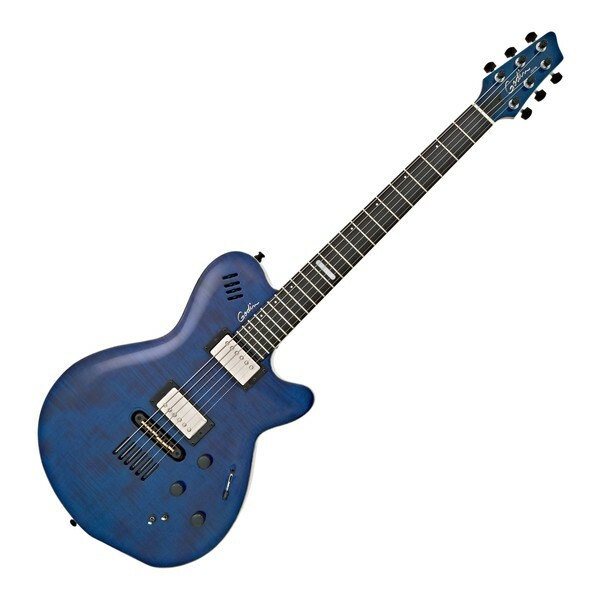 The Godin LGX-SA also offers added comfort to each performance due to its cutaway profile, promoting the access to upper fingerboard shredding while adding further aesthetic appeal. The Godin LGX-SA offers incredible versatility and power within three distinct voices, perfect for the recording or performing musician that craves a unique guitar to get the creative vibes flowing. The Godin's body is crafted from solid mahogany and capped with a figured maple top that not only projects an excellent tone but offers a pleasing aesthetic. Godin's goal with each guitar is to find the perfect balance between the finest traditions of guitar crafting, developing new design concepts, and the integration of the latest developments in related electronics. From the selection of tonewoods, to the final adjustments, to the finished instrument, each Godin guitar is designed and constructed by people who truly love guitars. The LGX-SA has a neck constructed from mahogany which adds warmth and resonance to the tonal output while providing and quick and dynamic response. 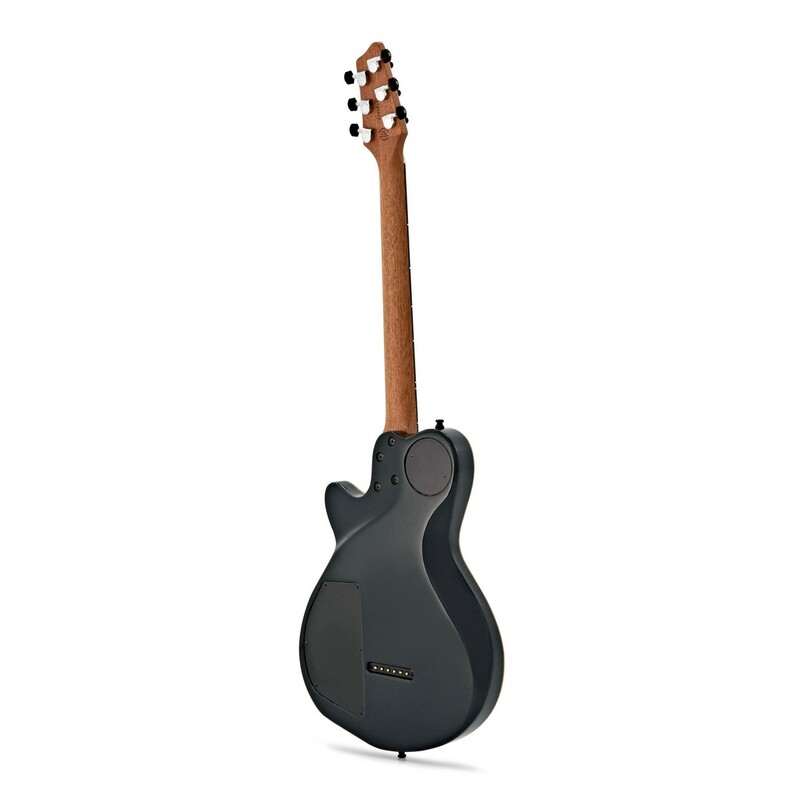 Its specially designed neck is pitch angled, resulting in a huge impact on the sound projected. 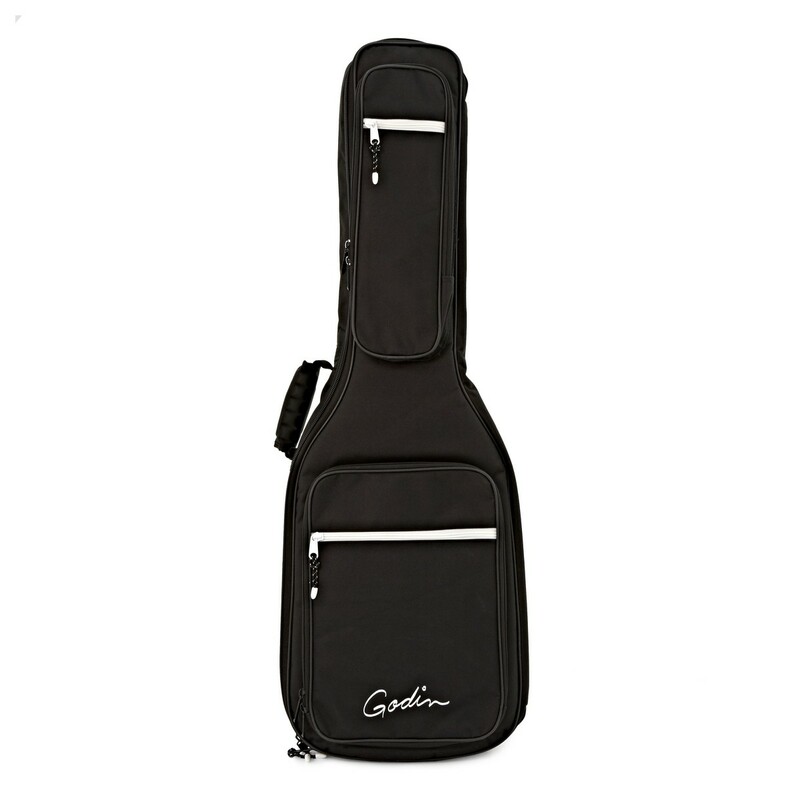 In addition, Godin are renowned for their tight-fitting neck attachments that offers precise neck pitch. Furthermore, the neck also has an Ergocut profile that bevels the edges of the fingerboard to provide the player with an incredibly comfortable, smooth playing experience with a worn-in feel. This special instrument comes equipped with two Seymour Duncan Custom Humbuckers, offering a SH II Jazz in the neck, and a Custom III in the bridge. In addition, the player is able to split the sound to achieve single coil tone via its five-way switch setup. Its pair of Custom Humbuckers can also project massively meaty yet classic Humbucker tones with glassy single coil sonic characteristics in the second and fourth position. Furthermore, with this sonically pleasing pair of Custom pickups, the Godin LGX-SA is ideal for pristine cleans to gritty crunch, as well as searing leads, perfect for numerous genres and playing techniques. The Godin LGX-SA also features an on-board custom designed active preamp that is powered by a 9 volt battery, accessible through a small compartment on the back of the instrument. Additionally, the LGX-SA offers a unique bridge design loaded with RMX Hexophonic transducer saddles for a faithful representation of an acoustic persona. Furthermore, by simply turning down the electric volume and raising the transducer saddles volume, this eye-catching instrument from Godin certainly sounds like a traditional acoustic. 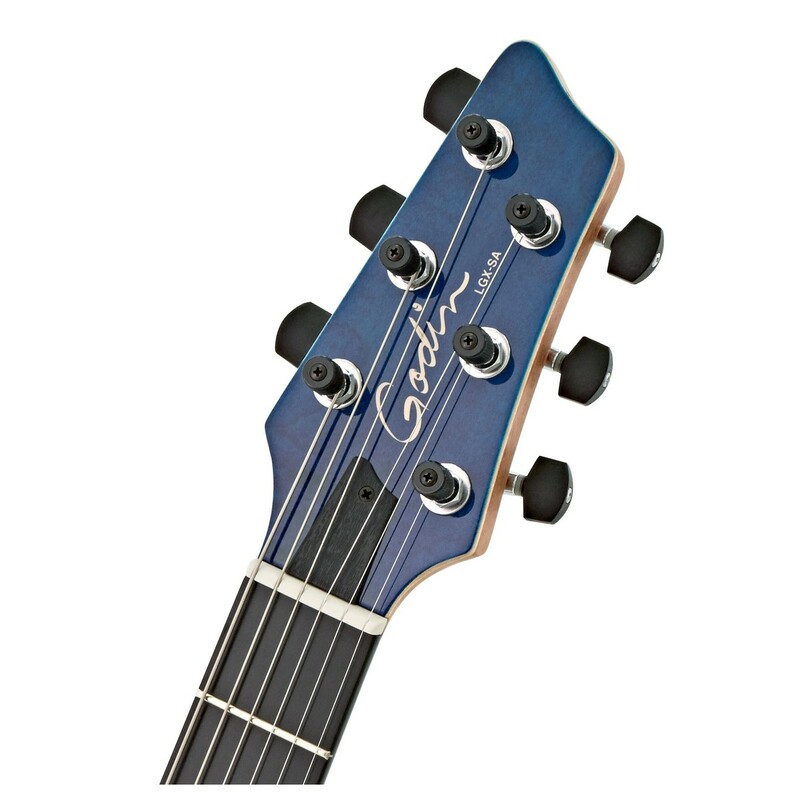 With Godin's custom preamp, the player is also able to shape their amplified acoustic tone via its 3-way graphic EQ. The acoustic voice is also ideal for the player that transitions between electric and acoustic on-stage, however, by owning the Godin LGX-SA the player can simply plug-in to one of the three outputs for an incredibly versatile performance. For extra versatility, the LGX-SA's third voice is certain to add a unique yet sonically-stunning addition to each live performance, offering a synth-ready guitar for the player with a creative vibe. In addition, the 13-pin connector provides direct access to all Roland GR series synths as well as most other 13-pin devices. The synth setting enables the player to achieve more unique tones, perfect for the creative composer and those that want to add a distinct and sonically-extraordinary sound. With all this, the Godin LGX-SA is one of the most versatile guitars on the market, providing the player with two mini toggle switches that can be alternated between all three voices.